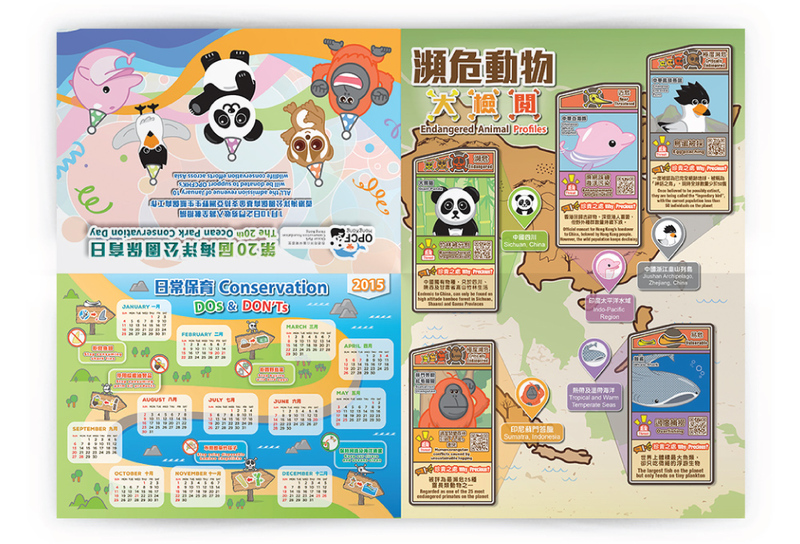 To celebrate 20 years of achievements in Asian wildlife conservation, a series of educational booth games and exhibition are organised on the 20th Ocean Park Conservation Day. We have developed various fun and meaningful exhibition panels and games to promote wildlife conservation, with a focus on the giant panda, the Chinese white dolphin, and the Chinese crested tern. Through the games and exhibition, guests can turn their passion for conservation into action, and to promote the conservational message to their friends. To celebrate the conservation achievements of Ocean Park and OPCFHK in the past 20 years, Foundation Chair and Director of OPCFHK, Chairman of Ocean Park, Government Official, and Ms. Michelle Reis participated in the celebration ceremony of the 20th Ocean Park Conservation Day. They hold a banner printed with different animals, signifying that human and wildlife can go hand in hand and live together peacefully. 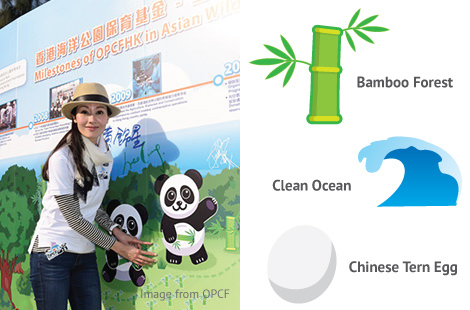 A 10-meter wide backdrop was built to showcase OPCF’s efforts in Asian wildlife conservation and success stories, guests are invited to pledge and protect these wild animals by putting up some stickers on the backdrop which signifies – rebuilding bamboo forest, cleaning polluted ocean, and returning stolen Chinese Crested Tern’s egg. Habitats of giant pandas are highly fragmented and are diminishing due to human activities. Ms. Michelle Reis was helping to rebuild bamboo forest in the Giant Panda’s habitat. Interactive, illustrated panels are developed around the Park to educate visitors about the threats of the endangered animals, and how we could protect them in our daily life. Cross-fold leaflets with animal conservation tips were distributed to visitors on the 20th Conservation Day in the Ocean Park. On the leaflet, readers could read about the profile of the endangered animals. There is a 2015 calendar with conservation tips for people to use. 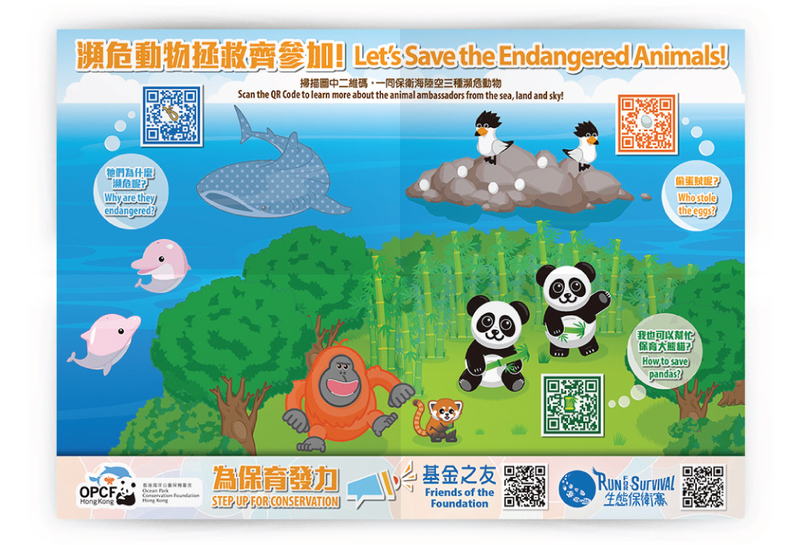 When the leaflet is unfolded, readers can scan the QR codes on the poster to see short animations about the endangered animals.